Just a few days after Typhoon Haiyan made landfall and wreaked extreme devastation in the Philippines, Apple began accepting monetary contributions to the American Red Cross' relief efforts via a special donation page on iTunes. Now, the company has gone one step further in aid of Typhoon Haiyan relief by releasing a benefit compilation album called Songs for the Philippines. Exclusively available on iTunes, Songs for the Philippines is one of the global music community's ways of helping raise funds for the relief efforts for people who are most affected by Typhoon Haiyan. As the people of the Philippines recover and rebuild in the aftermath of Typhoon Haiyan's devastation, some of music's biggest names are brought together on this benefit album. Including songs from The Beatles, Bob Dylan, Beyoncé, Adele, U2, Lady Gaga, Justin Bieber, Lorde, and Imagine Dragons, this brilliant collection is united by a message of hope and compassion. 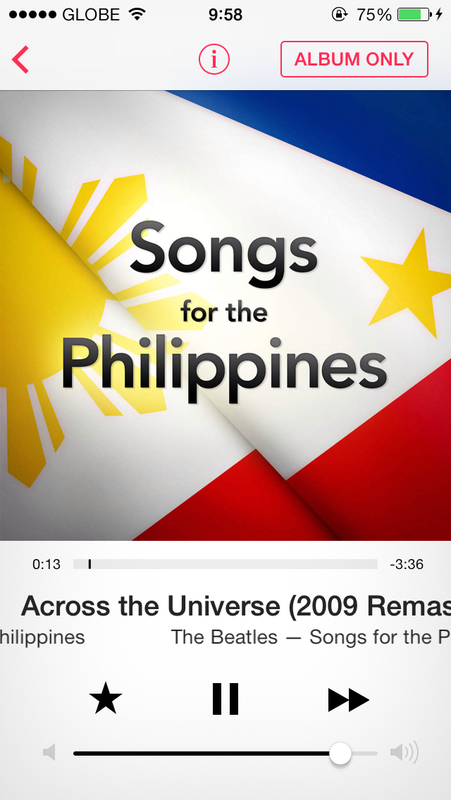 The Songs for the Philippines benefit album is available to download from the iTunes Store for $9.99. It's also available to stream on iTunes Radio for free. Along with Songs for the Philippines, Apple has also just released another album for a good cause called Dance (RED) Save Lives, Vol. 2, which is available now to download in the iTunes Store for $9.99. Launched in partnership with U2 frontman Bono's (RED) brand, Dance (RED) Save Lives, Vol 2. will benefit The Global Fund to Fight AIDS, Tuberculosis and Malaria, the same beneficiary of the recently concluded (RED) Auction featuring products co-designed by Jony Ive and Marc Newson.